This medium-sized 68 quart storage trunk is an effective solution for storing your gear. Measuring 30" by 14.25" by 12.75" on the exterior, each one provides plenty of kit space without being too bulky for the trunk of your car or the hall closet. Molded grooves on the top and bottom of each case fit snugly together for secure stacking, perfect for bulk storage, and reinforced tie-down points on the sides keep them from sliding around in transit. The sturdy lids are lockable for extra security, but they can also be removed completely when quick access to your gear is the priority. 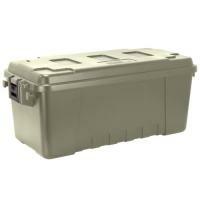 30" X 14.25" X 12.75"
Great for storing and toting gear to and from camping trips, to the range, etc.